I woke up a little late in the morning because of being tired from early morning flight the night before and being out till late as well. And I went down to the restaurant for breakfast which was a big enough buffet with hot and cold stuff. Only the taste of coffee wasn’t great which is often the case in buffet breakfasts anyway. I still can’t complain, as it was pretty good overall. 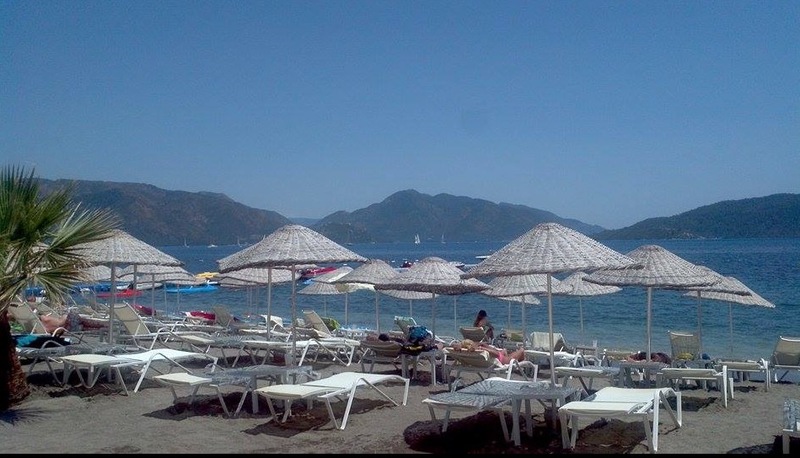 Even though the summer hasn’t started yet properly, the weather was super nice and the beach, the promenade and Marmaris town center were quite busy with foreign and Turkish tourists and locals. You can pay for the dinner buffet at Supreme Hotel Marmaris or you may also get it as half-board during your booking beforehand, which is slightly cheaper. There were also a few all-inclusive people at the hotel since the concept is quite common to hotels and resorts around Marmaris. This is offered mainly to British and Russian guests in their package deals which are often much cheaper than what is offered to Turkish guests. We’re talking prices as low as 5-10 pounds per person per night. And with more tourists staying in the hotel, eating and drinking in the house all day, the local economy is not really supported well and shop and restaurant owners tend to complain a bit. Truth be told, the main reason why Turkey has been such a hugely popular destination is it is outside the Eurozone and the prices are much cheaper than European competitors. Yes, the country is stunning with lots to see and do- there are beautiful nature and varied landscapes, ancient history, sun, beach, and sea. But it is, unfortunately, the case for many tourists that come here, especially to the areas outside Istanbul, like the resorts on the Mediterranean and Aegean coasts. A lot of tourists from Finland used to come to Marmaris in the past, something I also noticed when I visited Marmaris 15 to 20 years ago. The tourist profile in Turkey has been changing over the last couple of years with this more Middle Eastern image that the country has, with the conservative Erdogan government. I dedicated my second day in Marmaris to visiting İçmeler and Turunç areas. And I got on my way southwest to İçmeler after meeting a local friend for a drink. I walked for about 7km along the beach to İçmeler for a bit over an hour, taking pictures of the beautiful spots as well. I had been sitting in front of the computer all day and 7 days a week for two years in Istanbul and wanted to burn off some 6-7 pounds. So it was good for me to walk as much as I could for a few days. Mind you, the hotel buffet breakfasts and dinners did not help my case a lot, I was even with what I burned and put on. 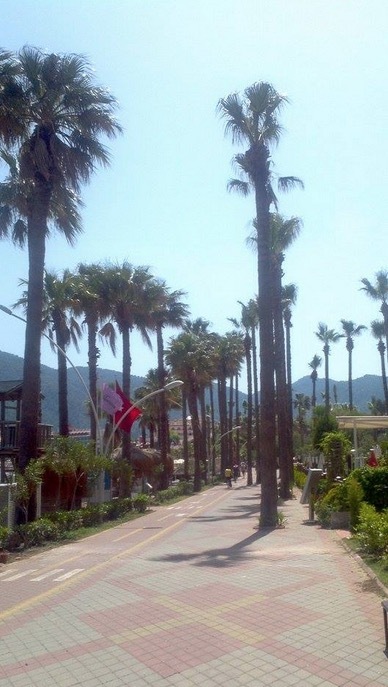 The promenade in Marmaris that takes you to İçmeler is very beautiful with palm trees and lots of greenery. There are many bars, cafes, and restaurants as well as the larger four and five-star hotels along the coast. Although the tourist season was just starting, the place felt rather lively. There were also a few people swimming in the sea. This is actually a common sight in Turkey outside summer, as those that come from Nordic countries in winter find Antalya and south Aegean coasts much warmer than back home. 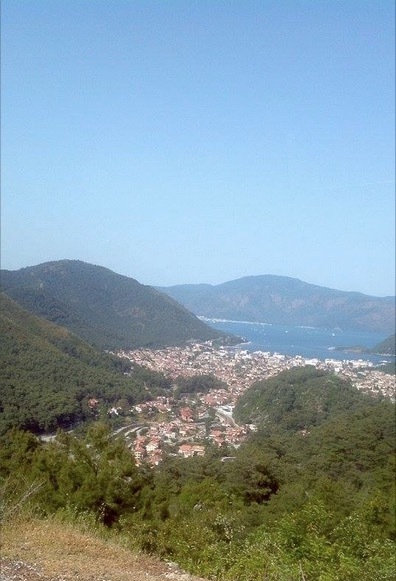 İçmeler is a district of Marmaris and is a much smaller residential area than Marmaris itself. You’ll find many tourist shops, larger and smaller hotels for different budgets, both on the beach and inland. The main public beach in Icmeler is wider than the long beach in Marmaris and the water looked clearer here. The sand was kind of reddish brown and the water looked beautiful in green and blue tones. Something that gets my attention is that the color of the soil here in Marmaris area is redder than other parts of Turkey. That is almost like the subtropical and tropical parts of Australia in Northern New South Wales and Queensland. Marmaris, with its lush green nature, palm and forests, has a more tropical look and ambiance as compared to other resorts in Turkey. 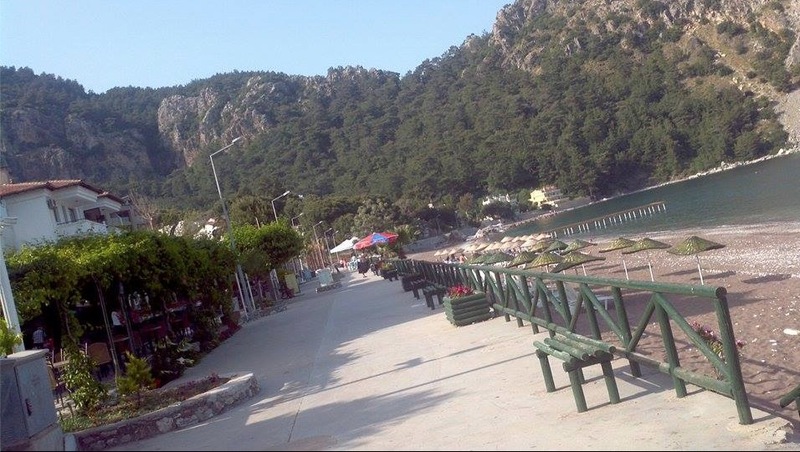 İçmeler is actually built on a narrow bay but the beach is wider and the town goes all the way inland up to the skirts of the hills, with many houses and hotels. 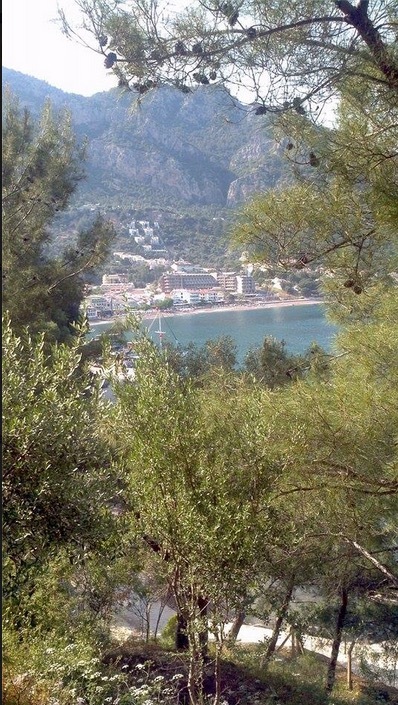 It looks a little like the Kemer area in Antalya, but nicer in my opinion. Real estate prices are not cheap around here as compared to other Turkish resorts. It is probably only cheaper than Bodrum and Çeşme. It looks a bit like a piece of paradise around here, it is so beautiful. 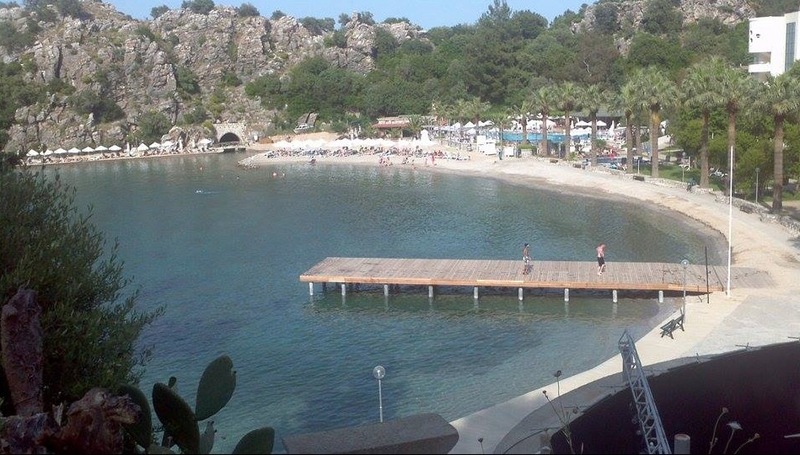 I got told that it gets very busy on İçmeler Beach in summer, being also a relatively narrow bay. After grabbing a drink I asked someone on which road the minibus that came from Marmaris heading towards Turunç passed by. There was information on hours as well at the bus stop, and I think it was every two hours in May. As there was still a bit of time for the minibus to arrive in İçmeler, I started walking up the hill to Turunç. Turunç is the next bay after İçmeler as you can see on the map and although it looks pretty close on the map when in fact it is more like 12 km from İçmeler and on the hilly and winding road. 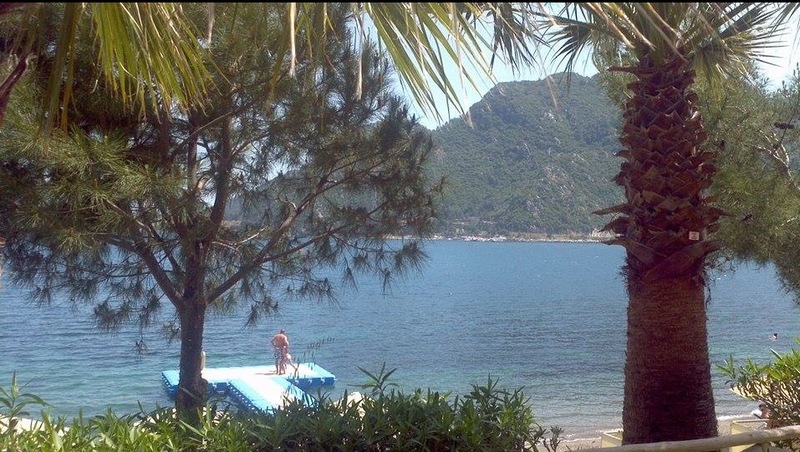 You can also get there by scheduled boats or there are daily boats that you can purchase in Marmaris. And some of them will take you to Turunç Bay as well. 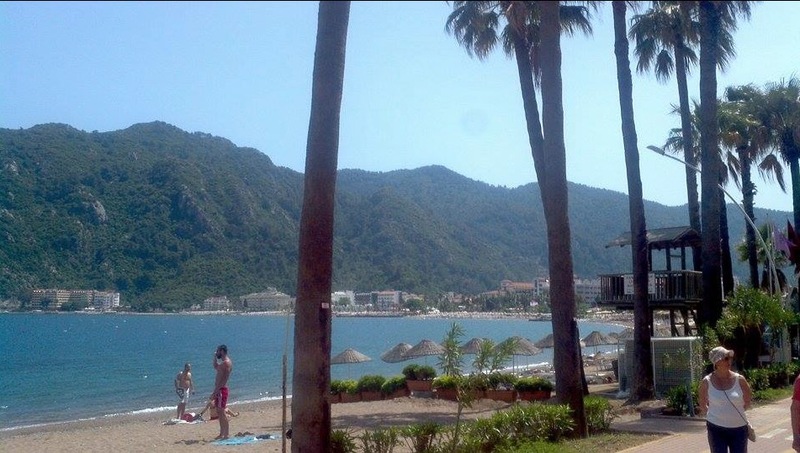 The sea in Marmaris is clean and clear enough and the beach is not bad but it is not like an aquarium or anything. Bodrum and Didim have the advantage for the sea and the beach. When I walked up the hill a little I got the beautiful trees of the forest on both sides. 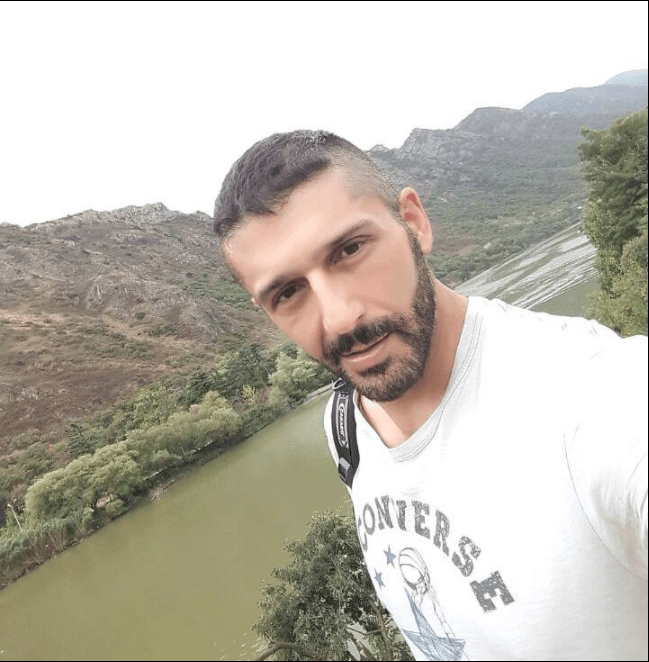 And when I looked back I could see the amazing view of İçmeler town up from the hill, and you get different angles of the view at different points. This felt like a great leg workout by the way. It took a while for the bus to arrive and I think I must have walked for about an hour. But the road and the landscapes were so pretty that it was impossible to get bored. The 12km distance to Turunç would feel like 20km if you walked all the way down there, with the ups and downs of the hilly and winding road. This road is certainly beautiful and you would get a completely different feel if you did this by boat, seeing the area from the sea. It is a good idea to take the bus to get to Turunç and the boat on the way back if you ask my opinion. Of course, this is if you do not have Turunç in the daily boat tour you may do. I arrived in Turunç 20-25 minutes later and again I was welcomed by an awesome view, heading down towards the little town. Turunc is smaller than Icmeler, about one-third of the area size and the population is about one-fifth. 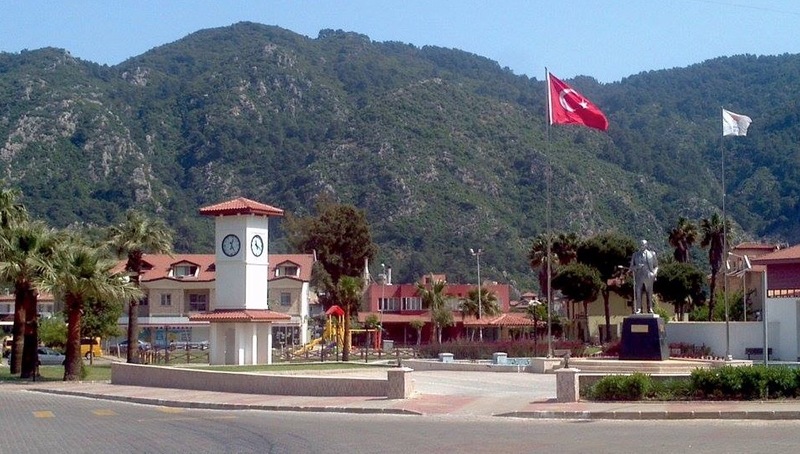 Winter population here is around 2000 and İçmeler has about 10,000 people and both are connected to greater Marmaris. Turunç is also a very beautiful town but to live in winter, it is a bit far from the center and may be a little too isolated. This, of course, will depend on one’s taste and preferences. I walked around the little town center, there were a few shops, restaurants and hotels. Turunç offers a nice alternative to the other busier resorts. It is nice, quiet and beautiful here if you want to just have some time to yourself and relax. 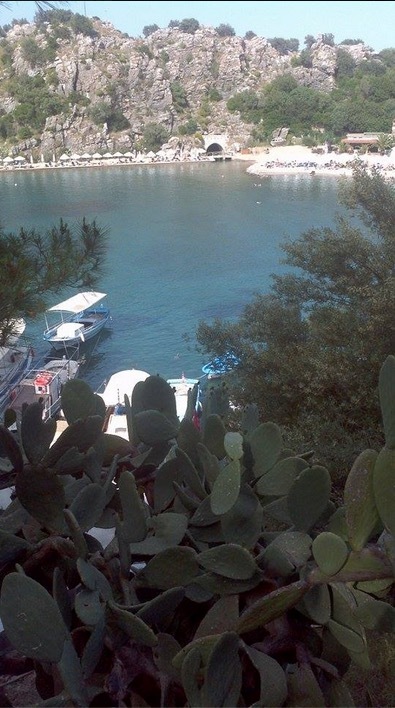 The most beautiful spot in the area is Turunc Resort Hotel, which is located on the right side of the bay and is a nice spot for taking a photo from above. I had to go into the hotel’s entrance but the security let me go up and I took a couple of photos. Then I headed down to the town center, and to the main beach. The water looked superb, the beach had a mixture of pebbles and sand and the ocean had pebbles. This was the main reason why it looked so clear, and also the water was flat, without waves. So I couldn’t resist it and got into the water. Water was a little cold, there were only a couple of people on the beach further down and it felt like the whole place was mine. Turunç is an extremely peaceful and a wonderful spot for holidays or just to visit for the day. Then, I returned to the high street to get something light to eat and took the next bus back into Marmaris. This time there were quite a few people in the minibus and I had to travel standing and the drive was not short at all. 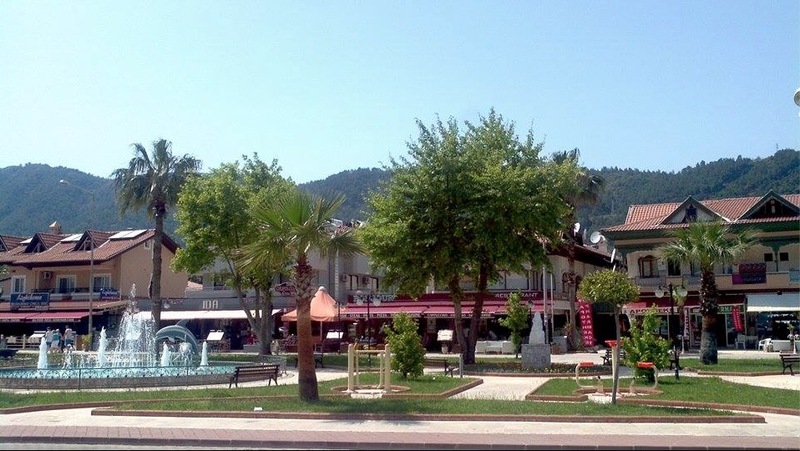 When we returned to Marmaris, I got off the bus a little earlier than where my hotel was and discovered the inner part of the town, with shops and a large mall. 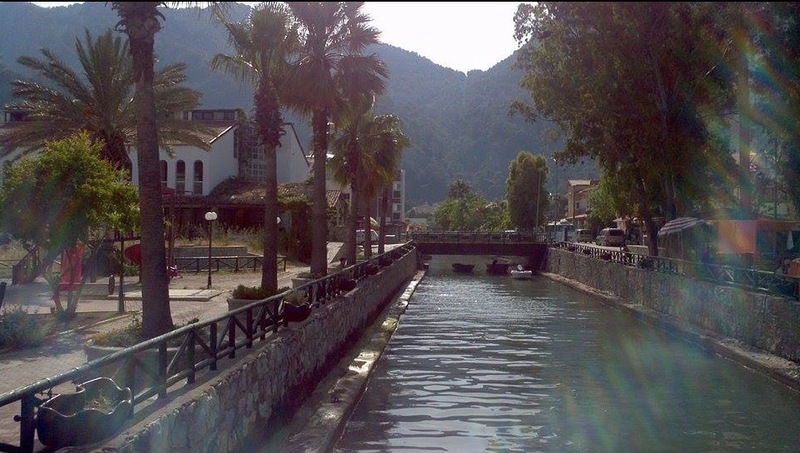 Marmaris is a very pleasant town, in a class of its own by Turkish standards. And although the property here is not as dear as Bodrum Peninsula, the prices are going up every year and closing the gap, which is an indication of the demand by local and foreign buyers. I went back to the hotel for a couple of hours’ of rest before hitting town again for dinner and nightlife. Again it was quite busy on Ataturk Street, along with the promenade, in the marina area and the bazaar. I had the full day boat tour of a few bays in Gokova and Cleopatra Island planned the next day so I couldn’t stay out too late as I had to get up early. The room at the hotel was quiet even though I was just above the hotel entrance. But the walls were a bit thin and I could hear next door bathroom noises- water flushing and showering etc. I was looking forward to the next day boat tour :).